Today is an important day in the evolution of mobile at SAP. If you’re a fan of Android (which I know many of you are), it’s an important day for you too! As part of a continued focus on innovation, on developer freedom and on consumer and enterprise choice, we are happy to announce the SAP Cloud Platform SDK for Android is Generally Available! If you would like to applaud now, I won’t blame you, I’m excited too! The release of this completely new SDK is an important milestone not only for our mobile platform and for our customers who are embracing Android, but also represents true differentiation for SAP. SAP’s relationship with both Google and Apple is truly unique and a compelling benefit for our customers. Experience – The Android SDK includes SAP Fiori for Android, the only native implementation of Fiori on Android available on the market today. Built with Material Design 2.0 in mind, the result is an app that looks like Fiori, feels like Android and is coherent with the Fiori UX on Web and iOS. I recommend you check out Santosh Kikkeri’s blog SAP Fiori for Android: Next Chapter for Enterprise Mobile Design for an intro, and for a deep dive, check out the brand new SAP Fiori for Android Design Site. The SDK also includes the SDK Wizard, an Android Studio plugin designed to enhance developer productivity. Answer a few simple questions and abracadabra (a technical term), a fully functional mobile app will appear, complete with Fiori for Android user experience, connectivity to a backend and a default implementation of several core services, including Logging and Push. For more information on the wizard, check out my Spotlight blog. Mobile Core – No one would buy a piece of software and call it “enterprise ready” without support for performance tuning, diagnostics, debugging and troubleshooting tools, access and authorization control or other app related services. You shouldn’t try to deliver a mobile app without those tools either – and this is where the mobile core or Foundation components of the SDK come in. Logging, Usage Analytics, Caching, Secure Storage, Onboarding, Authentication, Push…these are just some of the Foundation components. Look for more information about these topics in future blogs. Data Integration – Mobile apps generally exist to deliver information from some system of record (cloud or on-prem, SAP or non-SAP). Using SAP Cloud Platform Mobile Services can integrate with any HTTP-accessible endpoint, but we can do some really special things when the backend is accessible using OData. Having a standardization layer on top of REST can be really useful – by inspecting the OData metadata we can enable the Wizard to easily create a default user experience, can generate proxy classes that simplify interacting with the backend, can manage the storage of backend data locally on the device. That last feature, affectionately called Offline OData, is often positioned as a capability to overcome network challenges (which it is), but for me the value of Offline OData is in the user experience. Create an app that loads data over the network versus one that loads the data locally – there is absolutely no comparison. The team has been actively engaged in the Early Adopter Care program and is extremely grateful for the collaboration we’ve received from customers thus far. For those of you who didn’t get involved earlier, it’s not too late! We are still accepting nominations for customers with active projects looking to build transformative mobile apps for Android. Click here to apply. Want to explore the SDK on your own? There are lots of resources to help. Check out the SAP Cloud Platform SDK for Android Learning Journey – https://help.sap.com/doc/0c3db190da2c4866a1f2906763d4f59a/Cloud/en-US/747d6d2ea0534ba99612920c7402631a.html. Answer a Question – Life is better when we help each other. Follow the SAP Cloud Platform SDK for Android tag and bookmark the Questions page for the Android SDK: https://answers.sap.com/tags/73555000100800001281. Provide product feedback – Yes you can influence product direction! Submit enhancement requests to the SAP Influence site – https://influence.sap.com/scp-android. We’re still working on providing a Blueprint and a Learning Journey – once they are available I’ll make sure to update this post! Get started today, and happy programming! Update Sep 29, 2018 – added updated video link. Updated Oct 11, 2018 – added SAP influence site link. Updated October 15, 2018 – added Developer site and Step-By-Step guide! Updated Nov 28, 2018 – Replaced many links with the SAP Cloud Platform SDK for Android Learning journey, since most of them are more appropriately referenced there. Also updated the link to the SAP influence site for the SDK and added the Blueprint link. What a great news, thank you Britt! Amazing! Tomorrow I would like to take some spare time to play with it. Thanks for sharing info. I did that and it was great. Is there any way to configure standard fiori app in this? Hi Mahak – standard Fiori apps are built using SAPUI5. Depending on the app, it may or may not be designed to render appropriately in a mobile browser. The SAP CP SDK for Android includes a native implementation of the Fiori design. While you can potentially reuse the OData layer, you’d need to use the SDK to create a channel specific, native user interface. I was exploring SDK in last two weeks and I like it very much. But I did not found any API or library for creating Charts in SDK . Could you please tell if SAP recommends some library for creating Charts or there is no one? Or the only way for visualizing data is the WebView with SAPUI5’s VizFrame? Hello Nikita – I look forward to hearing more feedback from you regarding your experience with the SDK. Regarding support for charts – it’d be great if you could put your request here – https://influence.sap.com/sap/ino/#/campaign/1576, it’s where we are gathering feedback for future releases. There are some publicly available charting libraries for Android – let me see what I can find out for you. Yep you are absolutely right, there are some charting libraries, for example AnyChart for Android. But I was looking for an official charting library that was made/suggested by SAP. I will provide you with more feedback regarding my experience with SDK after weekends if needed. Nikita Elsakov – if you follow me I think I can send you a direct message on this topic – btw, thanks for submitting your suggestion! I am following you and I would appreciate if you can send me a direct message. Much obliged to you for sharing this data, You have worked to perfection. Exceptionally supportive blog for individuals who need realize that Android development. These days, a business does not prosper quick without having a mobile-friendly nature. Android is an open source innovation. When we experience an exchange about cell phones, Android is all things considered, the one strong framework increasing all the consideration. The source code of the working framework is adjustable, which opens new prospects. The Android stage makes it simple for clients, as well as for the engineers to kick begin. Android application Development Company always works for giving better administrations to their clients. 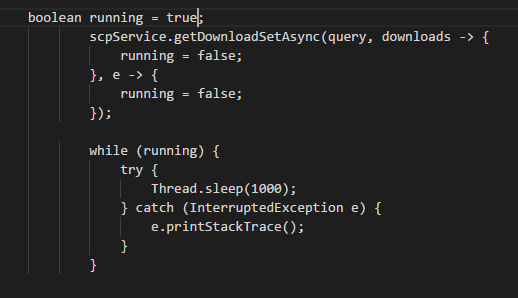 and it works only with getAsync. but when I do the same thing on createEntityAsync/updateEntityAsync/deleteEntityAsync response doesn’t return and system stuck in while loop. By default, queries are executed in parallel on Async.THREAD_POOL_EXECUTOR while CUD requests are executed serially on AsyncTask.SERIAL_EXECUTOR. This behavior can be changed by passing in your own executor. but I don’t know how can I change this behavior?